What better way to start the season of ~love~ than by talking about something I hold very close to my heart: mi cafecito (or coffee for you gringos). Coffee gets a bad rep and I really don’t know why. I’m here to set the record straight. Coffee is great for you! It’s considered to be a superfood (a food with many functional properties). Not only is coffee full of natural caffeine, it’s also loaded with disease-fighting antioxidants. There are thousands of research studies highlighting the benefits of coffee. How Coffee Loves Us Back: Coffee is everywhere, through history and across the world. And increasingly, science is demonstrating that its popularity is a good thing. Harvard scientists have for years put coffee under the microscope. Last year, researchers announced they had discovered six new human genes related to coffee and reconfirmed the existence of two others. What makes coffee so healthy? Coffee is naturally complex, containing about 1,000 natural compounds plus about 300 more are added during the roasting process. 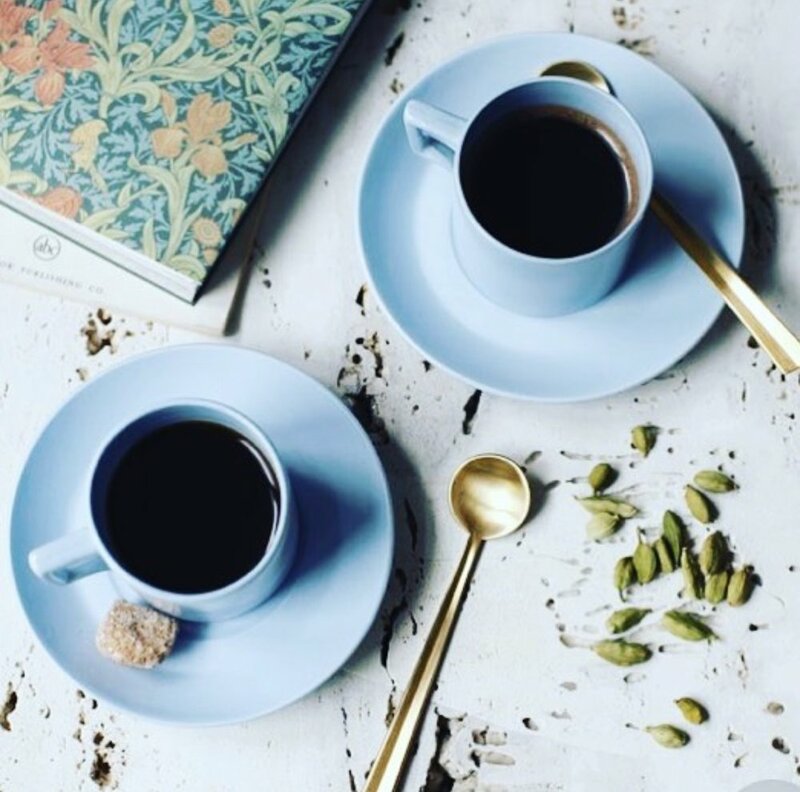 Chlorogenic, ferulic, caffeic n-coumaric acids and melanoidins are a few of the researched bioactive compounds responsible for coffee’s health-boosting benefits. In research, coffee has shown to lower the risk of some cancers like prostate cancer and skin cancer, type two diabetes, and even mental health issues like depression and suicide. Pro tip: Drink 8 cups of fluids daily to promote adequate hydration. Does coffee alleviate or cause headaches? In short, it can do both. On the other hand, coffee rebounds or “withdraws” are an actual thing. But not for many of us. Only about 2% of people experience coffee headaches after consuming excessive amounts. What’s considered an excessive amount? That’s up to you. This is when intuitive eating is important. Every person’s tolerance to coffee and caffeine will be different. If you’re like me you can drink >2 cups of coffee on a daily basis, stop on a random day, and feel no side effects. But if you drink only one cup and feel too jittery then you may need to drink decaf or just skip it all together. If you’re not a fan of coffee, that’s cool too. It’s not meant for anyone. Avoid hidden calories in lattes, frappuccinos, and other coffee beverages. Black coffee has little to no calories. When you add a 1.5oz (about a shot glass size) of whole milk it adds about 30 calories. Add a packet of raw sugar (1 teaspoon) adds another 20 calories. So, my average cup of coffee with whole milk and sugar is about 50 calories. I’ll take it. But when you don't have control of the amount of cream you pour in or how much syrup is pumped in you could be drinking up to 500 calories or more! Now that’s just crazy. Here’s a Buzzfeed list of 19 delicious dinner meals under 500 calories. I’m not mentioning calories because I think you should count them. In fact, I strongly oppose calorie counting. But it’s important to be mindful of the calories you consume and acknowledge whether those calories are nutrient rich or completely empty. Side note: Avoid creamers like Coffee Mate or Delights. They are filled with sketchy ingredients that I wouldn’t feel comfortable adding to my coffee every morning. I’m pro-organic dairy or milk alternatives (like soy or oat milk) but if you must use cream, choose natural half and half. I'd love to know how you enjoy your coffee or if you have any questions! Spread the love. Leave a comment. Jan 18 What is Kombucha and Is It Healthy?